Writer. Smalltowngirlandthebigcity.com ;Co-Founder of QueenCitySocialCLT.com. Known to have a soft spot for charities, adventures, and the occasional cocktail or two. The Holiday Season in New York City is a magical time. The streets are filled with tourists and New Yorkers heading in all directions. Iconic shopping streets such as Fifth Avenue are filled with lights, festive decorations, and promises of sales. The smell of winter and hot chestnuts on the street corners can be enchanting. If you're a local New Yorker, you know that this time also brings tourists, heavier traffic, and colder walks to work. 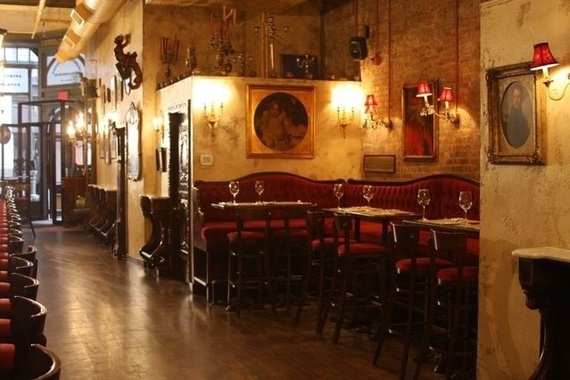 Whether a tourist or a New Yorker, these bars will help you feel the festive cheer. 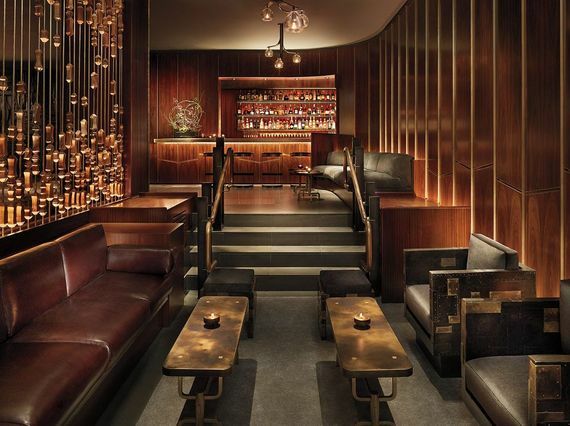 The Royalton is one of my favorite hotel bars. This boutique luxury hotel located in Midtown offers a dimly lit hotel bar with plush throws, cozy fireplaces, and sophisticated style. Located close to Bryant Park, the Theater District, and Grand Central, this hotel is a great meeting point for happy hours and dining. The Royalton's hotel bar, Bar 44, offers seasonal specialty cocktails that are created with fresh ingredients. The Royalton is currently offering the LionHeart as a limited edition cocktail to bring awareness to the (Red) Global Fund and AIDS Awareness. As World Aids Day was December 1st, the Royalton is donating a portion of the proceeds of the LionHeart cocktail to the (Red) Global Fund. Created by one of the Royalton's master mixologists/bartenders Albert Pero , the LionHeart is a delicious cocktail that not only infuses warm holiday flavors such as clove, allspice, and Belvedere (red), but also adds to a good cause. Served in a highball, the beverage is warm, earthy, and perfect to beat the winter chill. 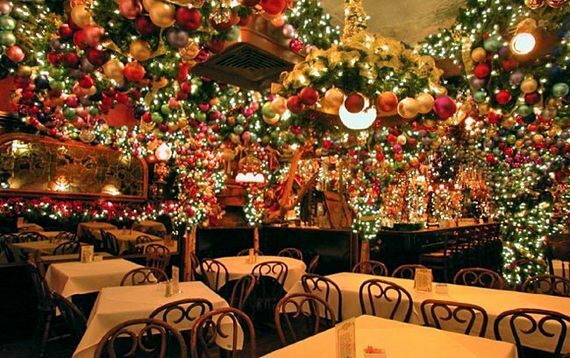 If you've ever thought about what the inside of a Christmas tree would feel like, stop into Rolf's German Restaurant in Murray Hill. As if appearing overnight after Thanksgiving, Rolf's transforms into a decadent and intricately detailed Holiday bar. Poinsettias and angels line the walls, and any surface that could have a garland, is decorated to have it. Rolf's becomes a hotspot during the winter season due to it's festive decorations. Since you're already in a German restuarnat, why not try the traditional beverage of German mulled red wine with oranges, lemons, spices, sugar, and a splash of brandy. Union Square's treasured Lillie's Victorian Bar & Restaurant, decorates in traditional Christmas decorations. The classic decorations make you feel as if you've traveled back in time to a Jane Austen novel. Named after Lillie Langtry, a famous British actress in the late 19th Century, Lillie's pays homage to the late 19th century style. The ornate wooden carvings and antiquities in Lillie's were procured from a ballroom in an 1800s estate in Northern Ireland. The establishment combines an authentic ostentatious decor with a down-to-earth, mellow ambiance, in tribute to the last great Victorian "gin palaces" that once flourished in the industrial cities of Northern Ireland and England. Be sure to see how many nutcrackers you can view in sight. Paying homage to the "gin palaces", this cocktail is light, refreshing, and slightly tart. After opening in 1864, Pete's Tavern is a Union Square institution. 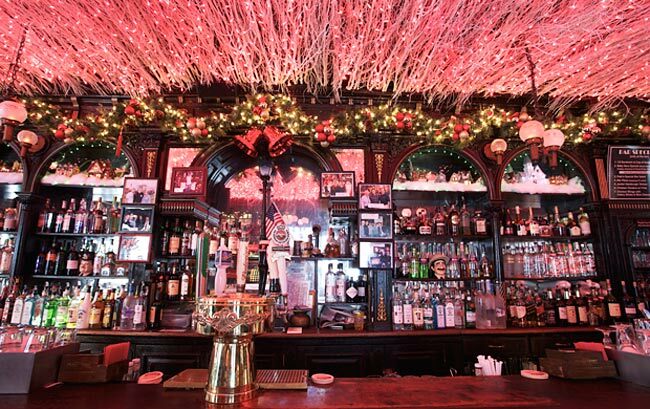 From the ornate wreaths outside to the entire ceiling covered in holiday lights, Pete's is a bar where the locals come to relax and feel festive. Head over to the Union Square holiday market after your creamy homemade eggnog peruse their many knickknacks and Christmas trinkets strewn around the space. Creamy, iced, and sprinkled with nutmeg, this homemade beverage brings tribute to Christmas past. New Yorkers find it hard enough to leave the island, so why make the trip to the Swiss Alps? This cozy Brooklyn bar is worth the trek to Cobble Hill. 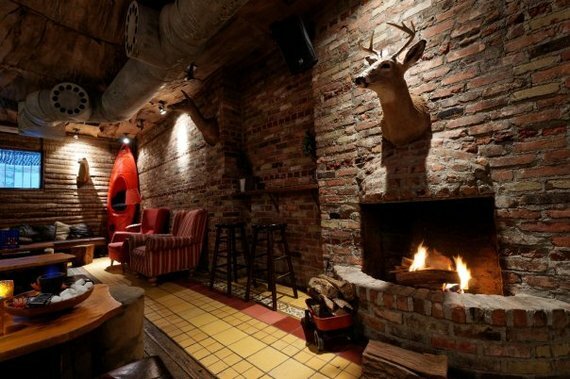 Feel like you've jet setted to a land of cabin décor and boozy hot toddies. My personal favorite festive treat at Camp is none other than old-school s'mores, served table-side with miniature Sterno burners. All the joy of the most wonderful time of the year without spending time with the parents? Now that's festive. Boozy Mint Hot Chocolate is in all its creamy goodness. Wear your favorite flannel and get festive.